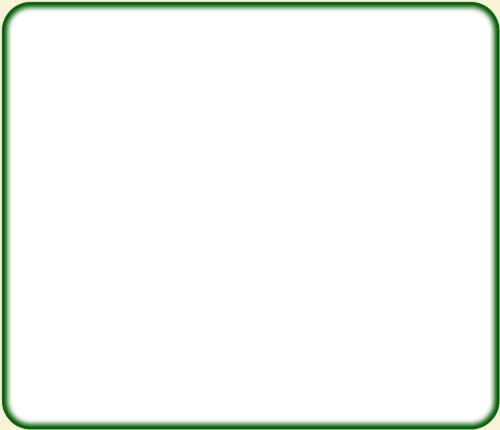 You are protected by SSL Certificate. Special: Buy 3 Siberian Cedar Nut Oil enriched with Sea Buckthorn berry and get 1 FREE! Special: Buy 3 Siberian Cedar Nut Flakes and get 1 FREE! 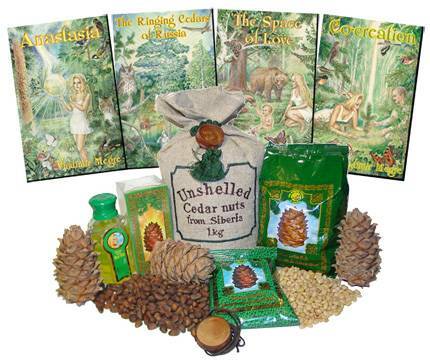 PROMOTION: Buy 3 0.5lb Bags of Cedar Nuts - Get 1 FREE! Book 8 p1 RUS sc. Book 8 p1 RUS hc. Book 8 p2 RUS sc. Book 8 p1 GER hc. Please navigate to any existing item by selecting an item on the left-hand navigation menu. 100% natural, Wild harvested, No preservatives, No artificial ingreedients, No GMO. Medical qualities of cedar are known to natural lifestyle since ancient times. They are now confirmed by modern scientific medicine, and supported by Christian and Vedic literature. Virtually everything in a cedar tree - from its needles to bark morsels - possesses medical power. During the past centuries the traditional medicine was the only choice for people, but today many of us use it consciously, refusing to be treated by chemicals and artificial substances. Natural substances that are part of the tree structure help human organism to regain its health and functional balance. They have certain effect on the live cells and tissues, at the same time balancing the processes within the whole human organism as well as within each cell. evoke feelings of love and goodwill in themselves and others. Those people gain talent, creativity aptitude, and luck. Any cedar morsel, given to people by Nature help to overcome illnesses. of your Love and your Light, which it gives back to you whenever you need it. Everything in the world begins with love. There exist "eternal" themes in literature and art. Epochs and generations replace each other... But love and faithfulness, wisdom and well-being, and family values immutably remain the most important notions for people. Poetry and songs are composed about them, masterpieces of art are created. Ancient symbols and signs that attract happiness, the observance of age-old traditions, the positive energy of the Siberian cedar - all this is combined together in each talisman of love in a sincere and refined desire - to find the wonderful feeling of love and preserve it for all one's life. The talismans in question are made with spirit, with wise and good thoughts. After all, the more happiness and love there is in the world, the brighter and more joyous it is to live in. "... Katun the khan's daughter and Biy the poor shepherd fell in love with each other. The cruel khan found out, and ordered that the lovers be separated. Biy and Katun then decided to flee. They escaped in the mountains, hiding from the khan's servants. The mountains were finally behind them, before them was a plain. The lovers now had nowhere to hide, and the pursuers were so close! ... The lovers embraced, bowed down to the ground, and became rivers, joining forever and running ever further as the deep, mighty, Siberian Ob River." The male and female figures are carved from a sheet of Siberian cedar that has been split into two and joined by a Heart - one heart for two. According to ancient tradition, any bond consists of two parts, fastened by a knot. 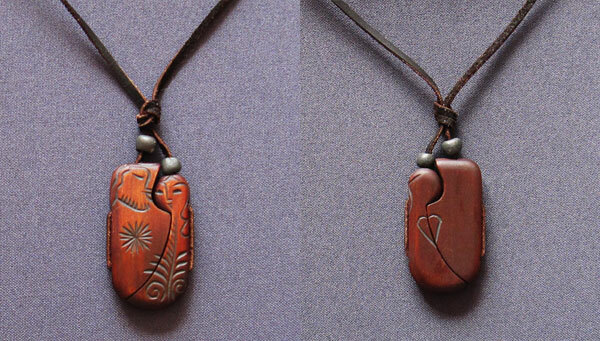 The "Soulmates" bonded amulet is carved from a single piece of cedar that has been split into two. The strength and energy of the male is symbolized by the Sun, the small female figure adorned with a Plant is the symbol of Life. 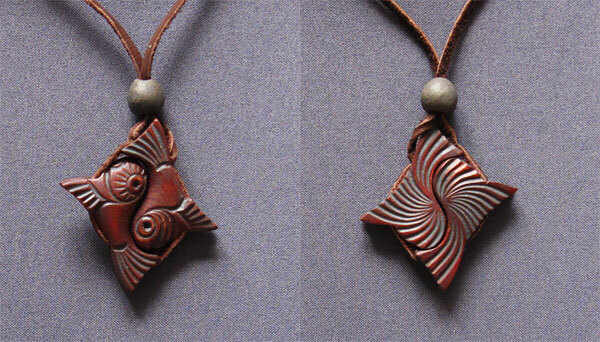 Two lathed cedar beads are two individualities, which blossom in happy union, and on the reverse side of the amulet is a Heart - one heart for two. According to tradition, any bond consists of two parts, fastened by a knot. The "Yin-Yang" bonded amulet is the ancient sign of the Unity of the female (Yin) and the male (Yang) beginnings, fastened with the symbol of Faith - a bead. The wise men of the East advise: "Hold the opposite substances Yin and Yang, grasp the Living Fire of Truth." The sign of the Sun on the reverse is the symbol of the Energy of the Unity. Two legendary natural materials have been combined as a health charm: cedar and listvenite. From ancient times, it has been believed that listvenite provides protection from snake bites, and relieves headaches and bone fractures. This stone possesses great power. And the cedar accumulates positive energy and shares it with people: the Siberian cedar is generous with health! It is not by chance that the listvenite is enclosed in a cedar frame: in this combination its power will not harm the owner, but become a shield against sickness and negative energy. The charm-like qualities for health are intensified by the ancient symbol of life and blossoms - the flower of sun. From time immemorial, people have spoken of the Tree of the World, whose roots fasten the earth and are washed by the holy waters of the world beyond the grave, whose trunk is encircled by the snake, the symbol of the helical movement of energy, and whose crown extends into the Cosmos... For the Sumerians, the oldest of the civilizations we presently know, this was the cedar. ...the Earth Mother said to the Creator: "The sparks of the Fire of Your Spirit can offer salvation, but who will be the one to collect them and keep them safe until needed?" The Creator answered: "The trees and the grass will preserve My sparks, but when the sparks fall, then let the Cedar and his sisters preserve their receivers of Fire for the entire year..."
The cedar was considered to be the Holy Tree of Life among that most ancient civilization, the Sumerians, a mysterious civilization now lost to the ages that gave life to the entire modern world. The bearers of the secret, sacred Knowledge of Sumer believed that the cedar, a symbol of power, greatness, and immortality, was created by God as the storage chest of the energy of the Cosmos on earth. And for that reason it was given the holy right to have its own names depending on its place of growth and its purpose - religious, medicinal, for construction, and even as a standard, a measure of exchange much more valuable than gold. All this is confirmed by clay tablets seven thousand years old found in archeological excavations of the ancient kingdom of Sumer. The head of the Sumerian pantheon, the god Ea, who symbolizes cleansing water, was considered to be the patron of the cedar. Ea was the source of unattainable, hidden wisdom and secret knowledge that he could grant to a worthy person. And the most important thing he gave to people was Life. All precious metals belonged to him, he was considered to be the patron of blacksmiths, trades, culture, art, and science. The Cedar is much the same - together with Ea it personifies beauty (water in the conception of the Sumerians was something majestically beautiful), stability, immortality (some ancient cedars reach an age of 2000 years), health (that is, life), strength, prosperity (the development of culture, the arts, and science), divine pride and grandeur. Demand for the cedar in the Ancient World was so great that the most ancient Epic of Gilgamesh mentions a monster who protected a cedar grove from incursions by outsiders. The tradition of the divine cedar of Sumer was subsequently assimilated by other nations as well. The wooden details of the sarcophagus of the Egyptian pharaoh Tutankhamen (1356-1350 BC) as well as numerous religious articles from his tomb were made of cedar. And although the age of these finds exceeds three thousand years, they are in remarkably wonderful condition, not only has the structure of the wood been preserved, but also its subtle, tender odor. In Ancient Egypt, cedar resin was one of the main components of the balsams used for mummification. Thanks to cedar essential oil, priceless papyruses of the Egyptians have been preserved to the present day. The Phoenicians built galleys of cedar, cedar was in great demand among the Assyrians as well. A fleet of cedar was also built by the legendary biblical King Solomon, who constructed. also entirely from cedar, the Temple at Jerusalem and his enormous imperial court, giving away twenty cities in exchange for this precious material. Gopher wood, from which Noah built his ark, was a cedar that grows on the Bahrain Islands. Trees may justly be called special reservoirs of energy. The result of photosynthesis in the green portions of plants is the formation of carbohydrates, rich in energy, and the release of oxygen. Plants trap the energy of the sun and cosmos, transform it, and thereby provide for life on the planet. Modern biologists have confirmed the ancient idea: the cedar has a soul. This amazing tree has the same biological rhythms as people. The cedar displays its activity not at precisely defined times, as do other trees, but depending on external circumstances. For example, on overcast days in the summer, it "wakes up" at 10:00 a.m., while on bright days it awakens with the dawn; there is a pause in its activity from 3:00 to 4:00 p.m. In the evening, the cedar is "active" until 11:00 p.m., and then "falls asleep" for the night. In the winter its life cycles are not suspended, as with other trees, it remains awake, but only "sleeps" much longer. The curative properties of cedars have been known to medicine from the earliest times. Even the Sumerians used extracts, broths of cedar needles, as compresses and poultices. Modern scientific medicine, just as many more ancient teachings regarding health - Eastern, Tibetan, Vedic - confirm the great medicinal properties of the cedar. Literally everything in it - from its green needles to pieces of bark - is of benefit to people and the entire environment. Berries and all plants growing in cedar forests are richer in vitamins and provitamins than those growing in other forests. This can be explained by the fact that the bactericides and fungicides of the cedar actively contribute to the formation in plants and fruits of vitamins and other biologically active substances. Bactericides and fungicides have a beneficial effect on people as well, first and foremost on the nervous and cardiovascular systems, and respiratory organs. The bactericidal and fungicidal properties of the cedar are amazing: the air in a cedar forest is practically free of pathogenic microbes. Over a twenty-four hour period, a hectare of these coniferous giants emits more than 30 kg of airborne organic substances, which have an immense bactericidal strength. In the opinion of researchers, this quantity of bactericides and fungicides is sufficient to render all the pathogenic microbes in a large city harmless. In the interaction of the cedar's bactericides and fungicides with ozone (O 3 ), the ozone molecules are activated, and their energy increases threefold in comparison with a normal molecule of oxygen. Thus, ozonides (O 3 -), which possess great bactericidal and medicinal properties, are continually formed in the air of cedar forests. In addition, the cedar's bactericides and fungicides increase the air's content of light negative ions, exerting a regulating influence on living cells and tissues, and making harmonious connections with all processes occurring both in the human organism as a whole, as well as each individual cell. Even among ancient medical practices (Eastern, Tibetan, Vedic), natural Siberian cedar essential oil was known as an effective remedy in bronchitis and infections of the urogenital system. L. A. Shchennikov, a well-known physician and professor, while striving to grasp the secret of longevity and healing persons from diseases, turned to the Bible, attempting to understand first and foremost the meaning of the letters inscribed therein. His conjectures about the method of regenerating a living cell encoded in the Bible were confirmed and later developed into a discovery. Based on the word post , the Russian word for "fasting," the professor compiled an "Alphabet of Self-Knowledge," deciphering this word as "continuing the movement of the birth force." According to the interpreter proposed by the professor, "cedar" is "the root of the new marvel of birth." The Siberian 'Cedar' (also known in the West as the Siberian pine) is one of the most beautiful and majestic trees on the Earth. Ever since the very earliest times it has been considered a life-giving, healing tree. Cedar wood excretes phytoncids, which destroy disease-inducing micro-organisms and serve to purify the air with healing and healthful properties. In the Old Testament (Leviticus 14: 4) God teaches how to heal people and even disinfect dwellings with the help of... the Cedar. Scientists note that Cedar-panelled rooms are practically bacteria-free, down to 200 - 300 bacterial cells per cubic metre. It should be pointed out that according to medical standards, even in operating rooms a level of 500 - 1000 non-pathogenic microbes per cubic metre is permitted. Cedar walls emit positive energy. In Cedar houses the air is always clean. Siberian Cedar timber has a beautiful composition, with a lovely rosy colour. The noble colour of this sacred tree delights one's eyes and cheers one's mood year after year. Cedar timber is resilient against decay, and is hardly ever subject to canker-worm. The cedar tree and the cedar nut oil have a special spirit and influence. They eliminate tension, increases bodily immunity, and facilitates rapid health recovery after a difficult disease or operation. The Siberian Cedar is the beauty and national pride of Russia. Residents of Siberia use Cedar wood in their everyday lives. Carpenters lay down Cedar floorboards in peasant huts, which are both beautiful to look at and warm to the touch. The Cedar's resinous wood wards off all sorts of bugs, and thus has been used from the very earliest times to make furniture, including trunks, wardrobes, cupboards and dressing tables. Cedar furniture is never troubled by moths, but even when dresser drawers or trunks were made of other kinds of wood, they would invariably place cedar cones in them. Just like the wood, Cedar cones ward off bugs with their scent. Peasants in certain regions believed the Cedar wood killed harmful microbes. And so they preferred to make the bottom and lid of birch-bark cylinders out of Cedar. In Western Europe cedar wood was used in the manufacture of milk jugs. The craftsmen claimed that milk kept in such a jug would last a long time before spoiling and would take on a pleasant flavour. All products made from Cedar possess a powerful beneficial energy. You can make anything out of a cedar trunk: a house frame, a door and doorframe, furniture or house wares. You can put any clothes in a cedar chest or wardrobe without worry. Moths won't get to them because the aromatic, tarry smell will repel them. Cedar planks are the most sought-after raw material for pencil factories. Cedar wood has excellent resonance qualities and is used to make grand pianos, harps and guitars. In the famous Epic of Gilgamesh (Sumer, 2700 BC), the Goddess of Love (in ancient times Inanna was considered to be the Goddess of Love), infatuated with the handsome Gilgamesh, offered him to be her husband by saying: "Be you my husband, and I will be your wife!...Come into our house, with the fragrance of cedar." "I have covered myself with the oil and scent of cedar. I am as honey... The fragrant cedar oil on my skin shall be as a path of love, which summons you to the tenderness I seek to make you smile and to give you happiness." Man and woman are drawn to each other by forces unknown. The power of these forces symbolizes love. "Gilgamesh offered to cut the giant cedars on the edge of the forest...and the axes made by Uruk's masters began to work. ...And Gilgamesh began to cut the trees while Enkidu rooted out the stumps. And when their work was done, Enkidu said to his friend: "Hang your battle axe on your belt...let us take the cedars to the shore of the Euphrates!" "And as a sign that he wished to wed Inanna, Dumuzi, in the custom of his ancestors, poured cedar oil on the doorstep of the house of Ningal..."
Druids, the ancient Celtic priests, possessed deep knowledge about the nature of trees and their connection with man and the Universe. The cedar was one of a number of "healing trees" they identified. The cedar's special properties were noted by several races in the Bible. Thus, in Leviticus, the third book of Moses, God teaches priests to heal people. Of all the plants, only cedar is mentioned several times as a healing and cleansing tree (a cure for leprosy, among others). The Mother of the World said to the Creator: "Sparks from the Fire of your Spirit can bring salvation, but who will gather them, who will keep them?" And the Creator replied: "The trees and grass will keep my sparks, but when the sparks fall let the Cedar and its sisters keep their elements of Fire for the whole year." (A. Klizovsky, The Fundamental Principles of Understanding the World in the New Era, volume 3). Russian cedar nuts were exported to England and other countries as early as the reign of Ivan the Terrible. Petr Simon Pallas (1740-1811), a Russian natural scientist and member of the Petersburg Academy of Sciences wrote in "Russian Flora": "The tips of young pine and cedar branches are praised by all the industrialists and seafarers of Siberia as the best antiscorbutic and balsamic medicine, and are considered by medicine to be a significantly powerful treatment for scurvy." I received my pendant a few days ago now and from the first night wearing it i could feel lighter in my body, no stress, no heaviness. It was also easier to access loving energy whereas before i used to have to meditate to feel *whole*. With treating pain, i didn't feel like it took it completely away, though i felt a *fighting feeling* going on, like it was trying to diminish the pain, which in that took most of it away. I feel naked without wearing the pendant now, i never take it off.. I would just like to comment on the cedar pendant which I have been wearing for a month and a half. There is definitely a positive change in my life, both in personal and health. I wear it all the time and sleep with it in the night. I've bought many of them as gifts for friends and family. They are also very pleased with the pendants. I love the pendant. It is beautiful and energetically quite unique. I just came back from a consultation with Premiere Research Labs out here in Arizona and I had it muscle tested. It has produced some of the most bizarrely high vibe energetic fields when added to the biofield of the human body, and it just does not compare to other devices and/or natural substances sharing similar energetic imprints. I am deeply grateful. Thank you so very much! 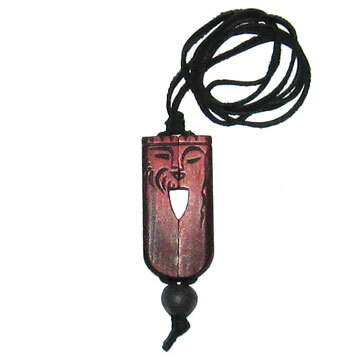 The first time I wore the pendant, I immediately felt some kind of energy surrounding me, it was warm and extremely pleasant. I felt so calm and relaxed, and actually the whole day I was extremely energetic. It is also my lucky charm, maybe a coincidence, but next day after I put it on I received a job promotion! My sister gave me a cedar pendant 2 years ago. I've worn it every day and have been polishing it with my fingers. People have been showing more and more interest in it and don't believe that the shine and polish has come from the oils on my finger tips alone! They are amazed at the beauty of the design and the fact that it's simply the natural rings presented from the simple cut. I can't wait for the colours to start coming out as it just gets more beautiful all the time. 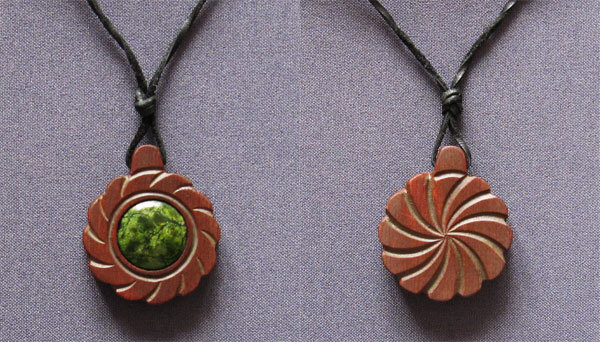 I bought few of the Cedar Wood Pendants, kept one for myself and gave the rest as gifts. Everyone I have given the cedar wood pendant to loves it! It feels wonderful wearing this high vibrational wood pendant and having a piece of nature itself at all times on my body. We all know that grounding is amazing for the body. 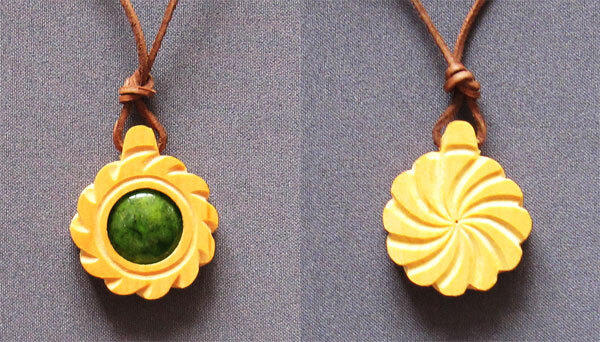 By wearing my cedar wood pendant, I feel connected to mother Earth even when I am indoors in a cold winter day. The Ringing Cedars series has been a huge inspiration to me and my family. We are striving to live a more wholesome life and connect with nature and the cosmos in a positive way. My wife and I purchased cedar pendants which we now wear all of the time! We also purchased some of the Kedra toothpaste which is also a wonderful natural alternative to the 'chemical' stuff available at the grocers. Thank you Vladimir and Anastasia for the inspiration to live in the natural world as intended. Buy 3 Siberian Cedar Nut Flakes and get 1 FREE! Special: Buy 3 Siberian Cedar Nut Oil enriched with Sea Buckthorn berry and get one FREE! Special: Buy 3 Siberian Cedar Nut Flakes and get one FREE! PROMOTION: Buy 3 0.5lb Bags of Cedar Nuts and Get 1 FREE! Essential Oil Cedar Needle 25g. Essential Oil of Cedar Cone 25g. Essential Oil - Siberian Fir 10g. Book 5 in Russian (soft cover) - Who are we? Book 5 in Russian (hard cover) - Who are we? Book 2 in Turkish (soft cover) - Ringing Cedars of Russia.